174 Marlborough is located on the south side of Marlborough, between Dartmouth and Exeter, with 172 Marlborough to the east and 176 Marlborough to the west. 174 Marlborough was built in 1876-1877 for dry goods merchant Eben Jordan (founder of Jordan, Marsh & Co.), one of six contiguous houses (166-168-170-172-174-176 Marlborough) built for him between 1874-1875 (166-168-170-172 Marlborough) and 1876-1877 (174-176 Marlborough), designed as three symmetrical pairs of houses. The six houses were built on two parcels of land, with a combined frontage of 150 feet, originally sold by the Commonwealth of Massachusetts at its public sale on April 10, 1869. Eben D. Jordan either was the successful bidder or acquired the right to purchase the land from the successful bidder. He completed the purchase and took title to the property only after the houses were built: a 100 foot wide parcel running west from Dartmouth on October 19, 1875, and a 50 foot wide parcel to the west of the first parcel on February 21, 1877. Click here for an index to the deeds for 174 Marlborough. Eben Jordan is shown as the owner on the original building permit application for 174-176 Marlborough, dated June 24, 1876, and on the final inspection, dated April 5, 1877. No architect is indicated on either document. On March 2, 1877, 174 Marlborough was purchased from Eben Jordan by Benjamin Smith Rotch. He and his wife, Annie Bigelow (Lawrence) Rotch, lived at 3 Commonwealth. 174 Marlborough became the home of the Rotches’ son-in-law and daughter, attorney Winthrop Henry Sargent and Aimée (Rotch) Sargent. 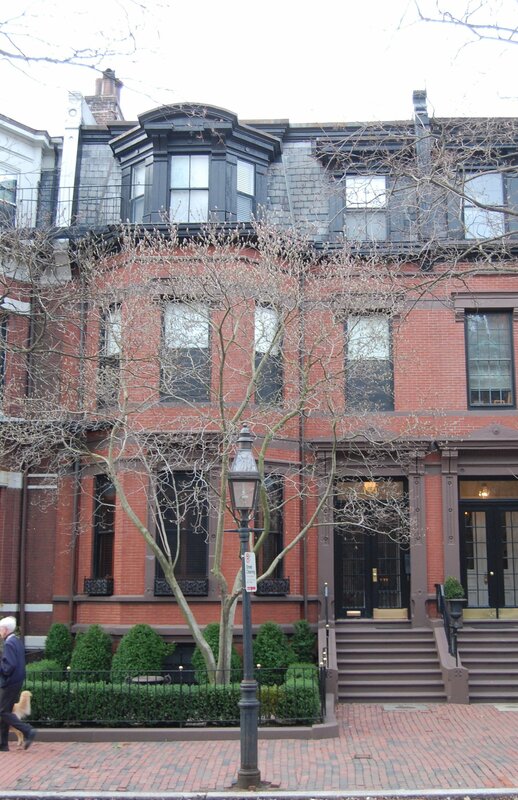 They previously had lived at 5 Marlborough with his parents, Henry Winthrop Sargent and Caroline (Olmsted) Sargent. Winthrop and Aimée Sargent continued to live at 174 Marlborough until about 1884, when they moved to a new home they had built at 207 Commonwealth. On October 13, 1884, 174 Marlborough was purchased from the estate of Benjamin Rotch (who had died in August of 1882) by Samuel Dennis Warren, Jr. He and his wife, Mabel (Bayard) Warren, made It their home. They previously had lived at 315 Commonwealth. Samuel Warren was an attorney, in partnership with future Chief Justice Louis D. Brandeis. After the death of Samuel Warren’s father in 1888, he withdrew from active participation in the firm and assumed management of his father’s paper manufacturing firm, S. D. Warren & Co. The Warrens continued to live at 174 Marlborough until 1889. They spent the 1889-1890 winter season at 151 Commonwealth (the home of Robert and Isabella (Hunnewell) Shaw, who were living elsewhere temporarily), and then moved to 261 Marlborough. On July 9, 1889, 174 Marlborough was purchased from Samuel D. Warren by sisters, Ellen Amory Dexter and Sarah Vincent Dexter. They previously had lived in Dorchester with their mother, Sarah Ellen (Vincent) Dexter, the widow of Charles Amory Dexter. Sarah (Vincent) Dexter had died in March of 1889. Ellen and Sarah Dexter were joined at 174 Marlborough by their first cousin, Mary Linzee Dexter, the daughter of Thomas Coffin Amory Dexter. On October 6, 1894, Ellen Dexter transferred her one-half interest in the property to Robert H. Gardiner and Charles H. Swan, as trustees on her behalf. Later that month, she married Dr. Albert Freeman Africanus King and moved to Washington DC, where he was a physician and professor of obstetrics. He had been in the audience at Ford’s Theatre the night President Lincoln was shot and was one of the first physicians in attendance. In 1880s, he was one of the earliest physicians to postulate a connection between mosquitoes and malaria. Sarah Dexter continued to live at 175 Marlborough, and on March 14, 1901, she acquired the one-half interest held by Ellen (Dexter) King’s trust. Mary Linzee Dexter continued to live at 174 Marlborough with her cousin. Sarah Dexter died in August of 1905. In her will, she left 174 Marlborough in trust for the benefit Mary Dexter. Mary Dexter continued to live there until her death in December of 1910. On May 8, 1911, 174 Marlborough was purchased from Sarah Dexter’s estate by Anna Maria (Warren) Glidden, the widow of John Murray Glidden, who had been a commission merchant and president of the Pacific Guano Company. She previously had lived at 18 Marlborough. She also maintained a home in Newcastle, Maine. Anna Maria Glidden’s two unmarried children, Joseph Warren Glidden and Anna Caroline Warren Glidden, lived with her. Anna Maria Glidden died in April of 1926. Joseph W. Glidden moved to Washington DC, and Anna C. W. Glidden probably moved to Newcastle, where she was living in 1930. On July 28, 1926, 174 Marlborough was purchased from Anna Maria Glidden’s estate by investment broker Harcourt Amory, Jr. He and his wife, Susannah Stoddard (Wood) Amory, made it their home. They previously had lived at the Hotel Hamilton at 260 Clarendon, and before that at 293 Beacon with his parents, Harcourt and Gertrude (Chase) Amory. On August 10, 1926, he transferred the property into his wife’s name. Later that month, Harcourt Amory applied for (and subsequently received) permission to build a three-story ell at the rear of the building, designed by architects Bigelow and Wadsworth. The Amorys continued to live at 174 Marlborough during the 1927-1928 winter season, but moved thereafter and by 1930 were living in Ipswich. They continued to own 174 Marlborough and lease it to others. By the 1928-1929 winter season, 174 Marlborough was the home of insurance broker Edward Eggleston Rice and his wife, Carrie Anna (Bingham) Rice. They previously had lived in Chestnut Hill. On November 2, 1944, Edward Rice purchased 174 Marlborough from Susannah Amory. Edward Rice died in August of 1945 when he fell from the 32nd floor of the Lincoln Building in New York City. Carrie Rice continued to live at 174 Marlborough until about 1954. On May 26, 1954, 174 Marlborough was purchased from Carrie Rice by real estate dealers Stuart H. Hastings and Joseph Gautreau. On September 2, 1954, 174 Marlborough was purchased from Stuart Hastings and Joseph Gautreau by Herman Curtis Hazlett, a machinist, and his wife, Lexie Winsome (Miller) Hazlett, a nurse. They operated it as a lodging house. They previously had lived at 279 Beacon. Herman Hazlett died in March of 1955; Lexie Hazlett continued to live at 174 Marlborough until about 1960. On March 9, 1960, Lexie Hazlett sold the property back to Stuart Hastings and Joseph Gautreau. On April 14, 1960, 174 Marlborough was purchased from Stuart Hastings and Joseph Gautreau by Ruth Frances (Gallan) Hanna, the wife of attorney Paul Charles Hanna, who continued to operate it as a lodging house. They previously had lived in Framingham and, before that, at 375 Beacon. They continued to live at 174 Marlborough in 1963. On April 12, 1965, 174 Marlborough was purchased from Ruth Hanna by Rev. George Nichols Marshall and his wife, Barbara Talbot (Ambrose) Marshall. He was director of the Church of the Larger Fellowship, a Unitarian Universalist congregation formed through correspondence, with no physical church location. George Marshall converted 174 Marlborough from a lodging house into four apartments (although no legal record of the change appears in the Building Department records). George and Barbara Marshall divorced and in October of 1966 she married again, to Elmer Rice (Elmer Leopold Reizenstein), a playwright, producer, and director. They lived in Stamford, Connecticut. On November 15, 1966, she transferred her interest in 174 Marlborough to her former husband. George Marshall continued to live at 174 Marlborough until the mid-1980s, when he retired and moved to Chapel Hill, North Carolina. 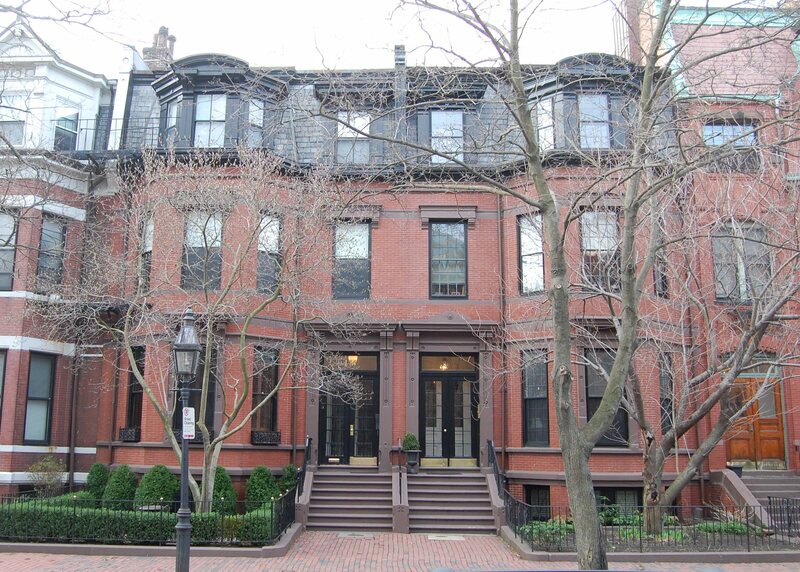 On February 6, 1984, 174 Marlborough was purchased from George Marshall by Kevin J. Ahearn and Charles F. Norton, Jr., trustees of the 174 Marlborough Street Realty Trust. On September 17, 1986, they transferred the house into Kevin Ahearn’s name, individually. 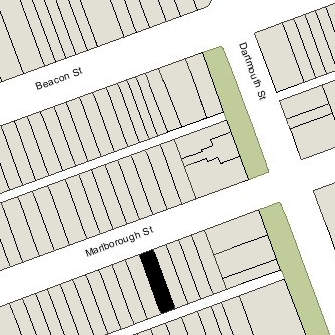 174 Marlborough remained an apartment building, assessed as a four- to six-family dwelling, in 2016.